Wednesday May 7th 1890 We done a large washing and ironing both today and Mother went to town after supper to stay all night Fanny and Hatt were over in the afternoon. Will went to the west farm to help fix the well. this is his birthday. Thursday May 8th 1890 Mother did not get home today. I sewed a little and finished fixing my gingham dress and began to work on a blue calico for myself. weather pleasant. I had a letter from Adda today who lived here last year. Friday May 9th 1890 I hurried through with my work this morning and got to sew some today. I planted a little more garden too. Will is busy planting corn. Mother come home this evening. Lee got home from Burlington last night. This is Hatties birthday. she is thirty three. 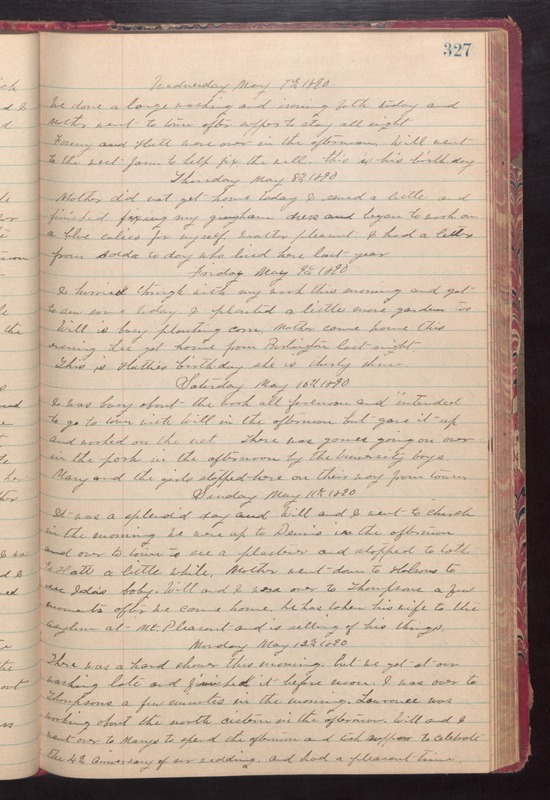 Saturday May 10th 1890 I was busy about the work all forenoon and intended to go to town with Will in the afternoon but gave it up and worked on the net. There was games going on over in the park in the afternoon by the University boys. Mary and the girls stopped here on their way from town. Sunday May 11th 1890 It was a splendid day and Will and I went to church in the morning. We were up to Dennis in the afternoon and over to town to see a plasterer and stopped to talk to Hatt a little while. Mother went down to Folsoms to see Ida's baby. Will and I were over to Thompsons a few moments after we came home. he has taken his wife to the asylum at Mt Pleasant and is selling of his things. Monday May 12th 1890 There was a hard shower this morning but we got at our washing late and finished it before noon. I was over to Thompsons a few minutes in the morning. Lawrence was working about the north cistern in the afternoon. Will and I went over to Marys to spend the afternoon and took supper to celebrate the 4th anniversary of our wedding and had a pleasant time.